One theme that I think has been underutilized in the board game industry is politics. The theme seems perfect for a board game. There have been a few political games made over the years but I have yet to play a really good one. Today’s game Lie, Cheat & Steal takes an unorthodox approach to the political theme. Instead of focusing on running a government or campaign; Lie Cheat & Steal decides to focus on the more nefarious aspect of politics mostly involving corruption. In today’s world people can rarely agree when it comes to politics, but one thing most people can agree on is that corruption is pretty rampant in politics. I thought this could have made for a really interesting premise as you tried to be the most corrupt politician. Lie, Cheat & Steal deserves credit for being ahead of its time with some interesting mechanics, but it unfortunately fails when it comes to execution. Each player chooses a pawn and places it on the start space. All of the players take $50,000 from the bank. The rest of the money forms the bank. Each player will start with a salary of $20,000. Sort the cards by their type and shuffle each deck separately. Place each deck face down on the corresponding section of the gameboard. All of the players roll the dice. The player who rolls the highest number will start the game. A player begins their turn by choosing whether they are going to buy any votes on their turn. Each player can purchase up to 20 votes from the bank. Each vote will cost $1,000. Players can also acquire votes based on the spaces they land on and other actions. Players should consider purchasing votes at the beginning of their turn though since if they lose votes, they must purchase them from the bank. To pay off a penalty a player can pay $1,000 for the first 20 votes and $2,000 for each vote over 20. If a player can’t purchase enough votes to pay a penalty, they will go bankrupt. This player has paid $5,000 in order to purchase 5 votes. After a player has made their decision on whether to buy votes, they will roll the dice. They will move their playing piece clockwise around the gameboard the number of spaces rolled. The player will then take an action based on the space they landed on. After a player has completed their action, play passes to the next player clockwise. If a player should ever run out of money and not be able to pay a penalty, the player will declare bankruptcy. 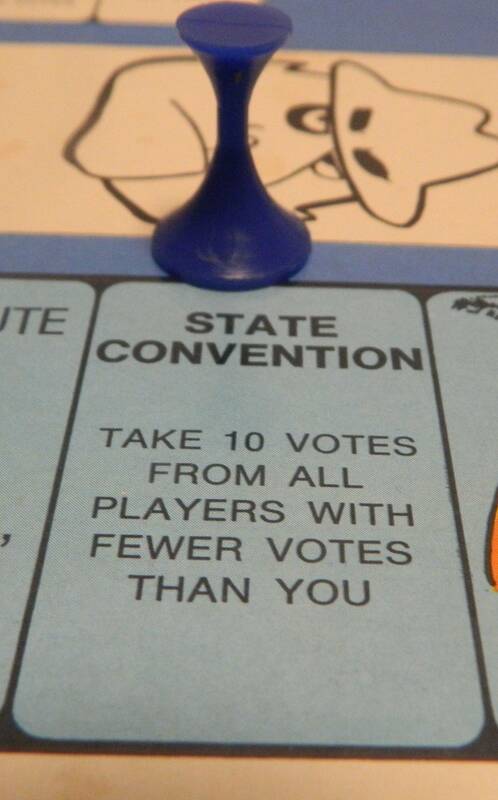 Before declaring bankruptcy a player can try to sell their votes to another player. The votes cannot be sold back to the bank. 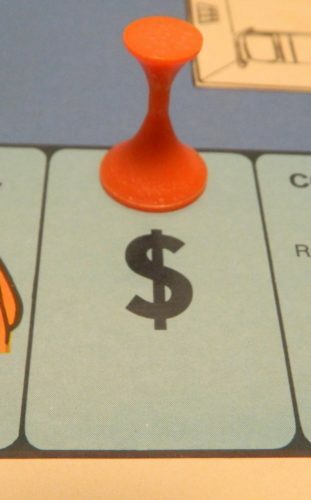 The player first pays off the debt they owe to the bank. If there is any money remaining, they pay what they can to any player they owe money to. 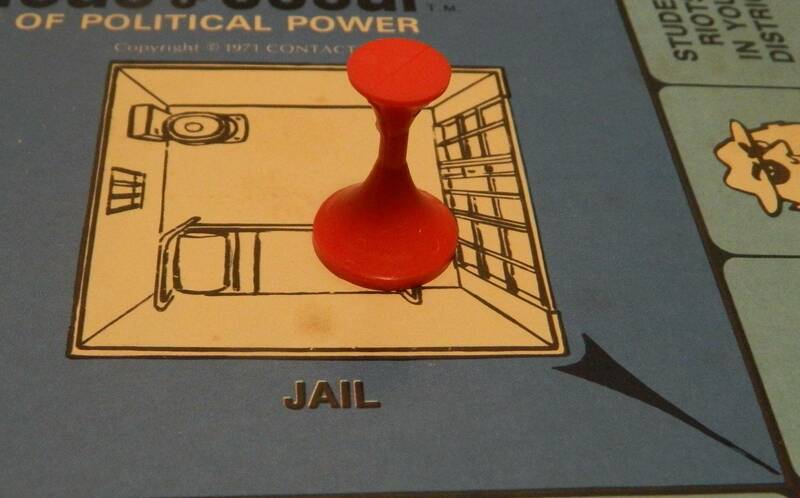 The player will then got to jail for their next turn. They will also have to get rid of all of their votes, and return all of their cards to the corresponding deck. The player’s salary also reverts back to $20,000. When a player lands on one of these spaces they will draw one of the corresponding cards. Each of these cards will either have the player pay or collect money from the bank. The amounts on the cards are in increments of $10,000 up to $100,000. The player that lands on the space reads the card to themself and then has a decision to make. First the player can choose to tell the truth and either collect or pay the amount listed on the card to the bank. 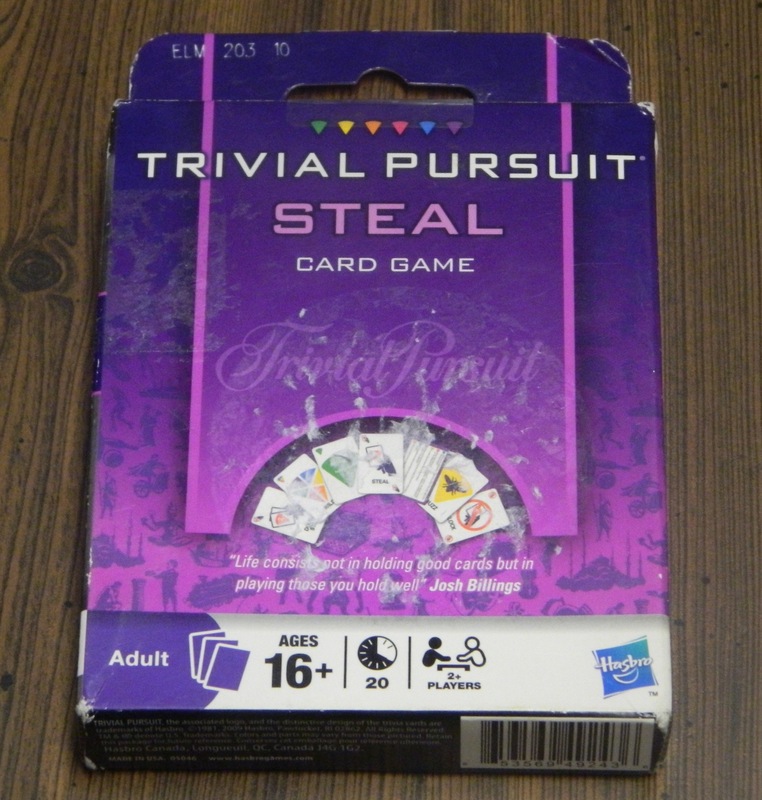 The player could also choose to lie about what the card says. They can increase or decrease what the card says or can change a card that would force you to pay into one where you collect money. All bluffs need to be in increments of $10,000 and can only go up to $100,000 as that is the max value on any card in the game. Whether the player told the truth or lied, they take/pay the corresponding amount from/to the bank. They will place the card face down in front of them. The player will keep these cards in front of them until they pass the Start space. The next time they pass Start they will place all of the cards in front of them on the bottom of the $ deck. This player has drawn a $ card that has them pay $50,000. They can either pay the $50,000 or they can lie about having to pay less or even earning money. When a player lands on a Black Eye space, they will draw a Black Eye card and add it to their hand. They can look at the card but should not reveal it to the other players. Most of the Black Eye cards are “blank” while there are a few that actually have a legit accusation. Pictured are two Black Eye cards. The card on the left is a “blank” card. The player will have to make up what crime is listed on the card. 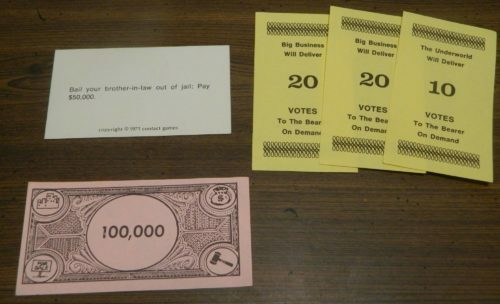 The card on the right allows a player to accuse another of being an embezzler. When a player lands on a Feather-In-Your-Cap space they will draw a corresponding card. They can look at the card and hold it until a later time when they want to use it. There are three different types of cards in this deck. Good Character Card: The player can discard this card at any time in order to avoid paying 50 votes to either the bank or another player. After it is used, it is returned to the bottom of the deck. Subpoena Card: When a player plays a subpoena card, they choose one player to send to the Witness Stand. Once the card is used it is returned to the bottom of the deck. When a player lands on a press box space, they have one of two choices. The first option is accusing another player of lying about one of their $ cards. The player chooses which player they think lied and which card they think they lied about. The player has to reveal the card to verify whether they told the truth or lied. If they were telling the truth, neither the accused or accuser are punished. If the player was lying about the card, they must pay the difference between what they said was on the card and what was actually on the card. The lying player also has to give 50 votes to the player who accused them of lying. Either way the $ card is returned to the bottom of the $ card deck. This player lied in the past about this card giving them $50,000. Another player called them out when they landed on a Press Box space. Since the player was caught lying they have to pay $100,000 to the bank (the $50,000 they originally took plus the $50,000 they originally owed). The player also owes 50 votes to the player who called them out on their lie. The player can also choose to play a Black Eye card against another player. The player chooses who they are going to target. They will accuse the player of the crime listed on their Black Eye card. If the Black Eye card is blank, they must pretend it has one of the crimes on it. 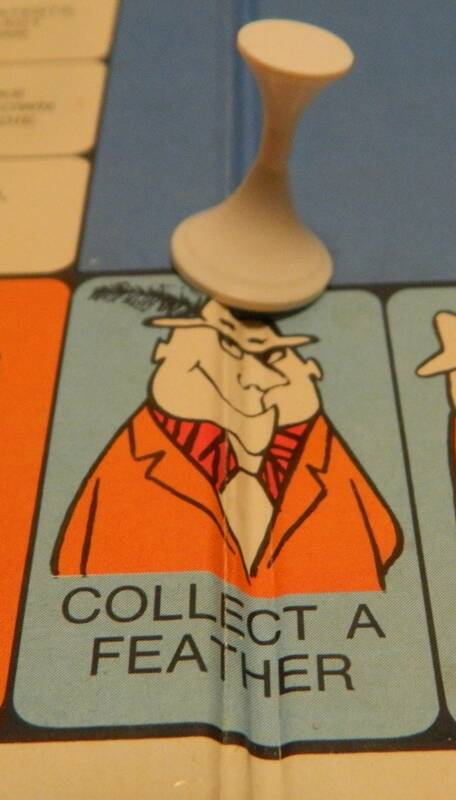 The possible crimes are shown in the Feather-In-Your-Cap section. 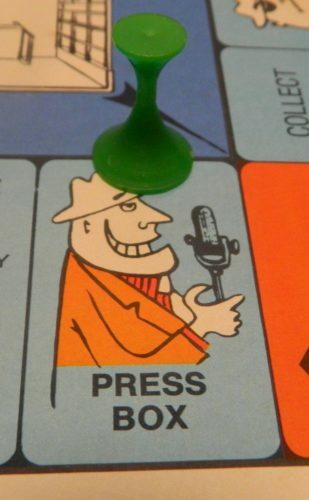 Once you accuse a player of a crime, that card can only be used on the player you first used it on. You may use it each time you land on a Press Box space though. This player has acquired a black eye card. As the card is a “blank” card, the player will have to bluff about what the card says. If the player who is accused of the crime doesn’t defend themselves, they will have to give 50 votes to the player who accused them. The accused player has a chance to defend themselves though. If the player uses a good character card, they don’t have to give up the 50 votes. 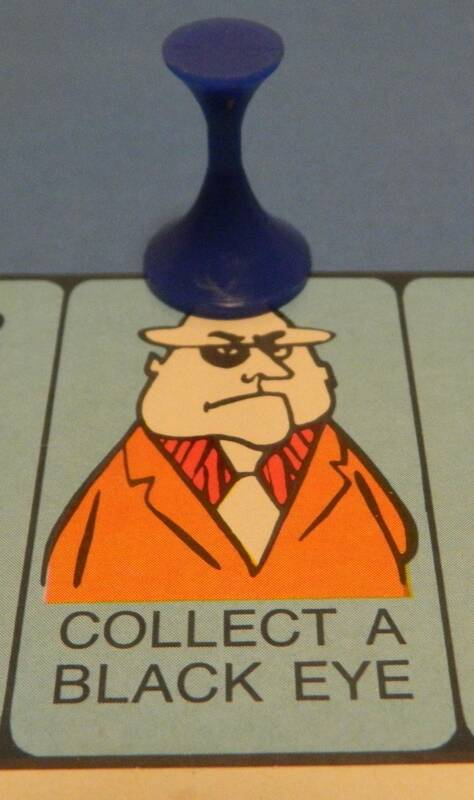 They can also use the appropriate Feather-In-Your-Cap defense card. This discards the Black Eye card and the accuser has to pay the accused player 100 votes. 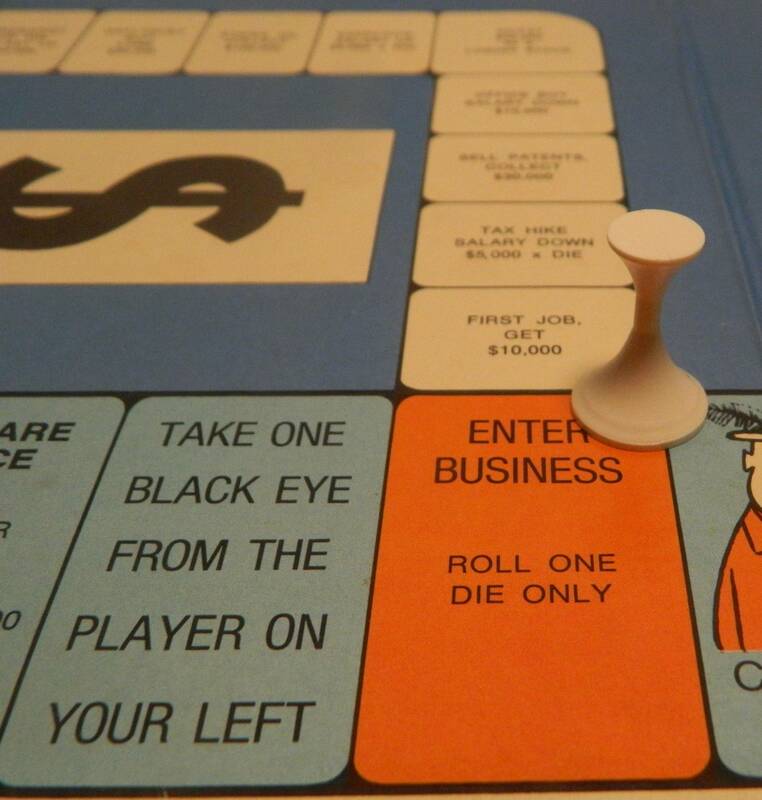 Unlike other spaces on the board, you may stop on this space even if your roll would normally take you past the space. When a player thinks another player used a “blank” Black Eye card against them, they may use this space in order to sue them. You must sue on your first opportunity after being accused. 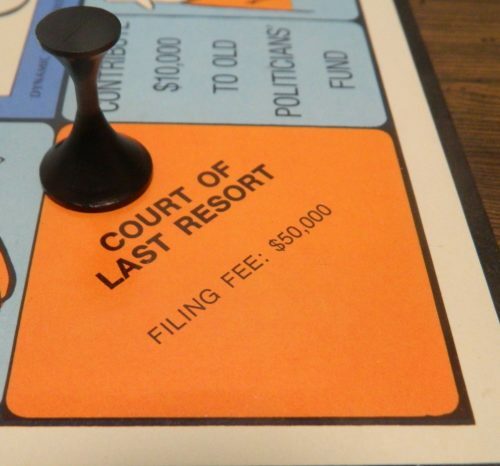 To use the court the player has to pay $50,000 to the bank. The player that used the Black Eye card than has to reveal it. If the player was using a blank card, they must pay the player they accused $100,000. The suing player also takes 50 votes from the bank. If the player was not using a blank card, the suing player has to give them 50 votes. In either situation, all cards used in the lawsuit are returned to the bottom of their decks. The player moves their pawn to the Witness Stand space. They do not collect money for passing the Start space. While on the Witness Stand you may not buy votes. You will roll one die each turn until you reach the end of the path. When a player is sent to jail, they lose their next turn. When they return to the board on their next turn, they will collect their salary. On your next turn you will enter the corresponding path. Each turn you will only roll one die until you reach the end of the path. 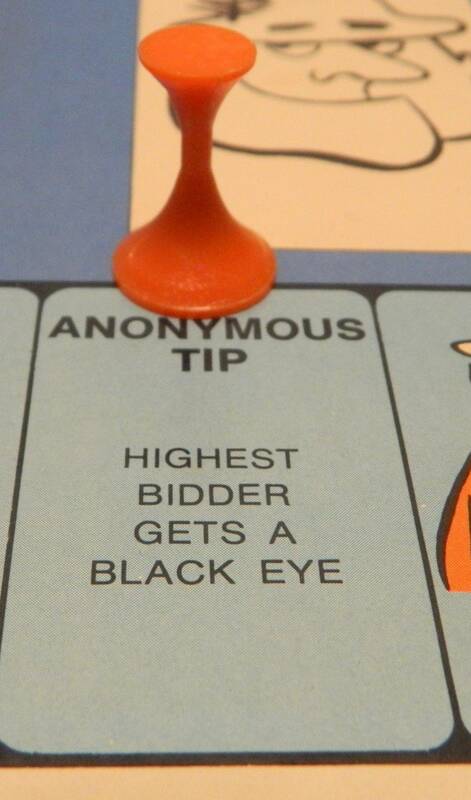 The top Black Eye card is put up for auction. All of the players are allowed to bid for the card without looking at it. At least $5,000 has to be bid or no one gets the card. Whoever bids the most pays their money to the bank and takes the card. The player who lands on the space will collect ten votes from any player who currently has less votes than the player who landed on the space. If a player has no votes, they do not have to pay the player landing on the space. The game ends immediately when a player has acquired enough votes. The first player to acquire 500 votes (400 in 5-6 player games) wins the game. This player has acquired 500 votes so they have won the game. 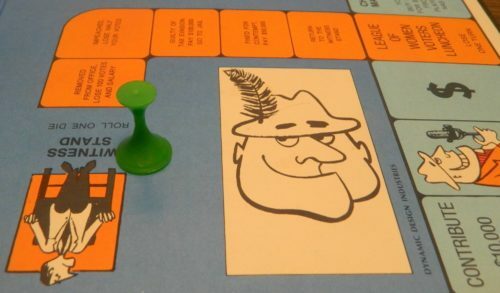 When you start playing Lie, Cheat & Steal the first thing that is going to come to mind is Monopoly. Monopoly has inspired a lot of games throughout the years and you can see how it inspired Lie, Cheat & Steal. On the surface the two games do share things in common including their gameboards which are quite similar. In addition to Monopoly the game takes inspiration from many other roll and move games. Basically the main mechanics in the game involve rolling and moving around the gameboard. You then do whatever the space you land on says. Anyone who has played a roll and move game before will find this to be very familiar. What is unique about Lie, Cheat & Steal is that the game actually adds some bluffing mechanics to the genre. I would be surprised if there were no other roll and move games that included bluffing mechanics. I don’t think I have ever played one though, and I have played a lot of board games. In theory this is a really interesting idea. Basically the game allows you to lie about what is on the cards you draw in the game. You can’t cheat or lie in any other ways but I found this to be pretty interesting addition to the game. I was actually surprised by how much the lying can impact the game. Unless you are really lucky, you will have to lie in order to be successful. 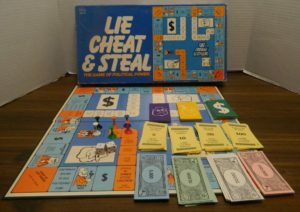 In addition to lying; Lie, Cheat & Steal felt like it had more potential strategy than your typical roll and move game. This mostly comes from figuring out how to manage your money and votes. Instead of only focusing on one currency, you have to manage both. You don’t want to ever be too short on either commodity or you risk going bankrupt. If you ever run out of money you will have to try and sell off your votes to other players in order to pay off your debts. You need to have enough votes on hand as well as you don’t want to be left without enough votes. You can acquire 20 additional votes for no additional cost but it becomes quite expensive if you need more than 20. There is some strategy in figuring out how you want to manage these two resources. Another thing that the game had going for it was the theme itself. Pretty much everyone can agree that politicians are corrupt. Therefore the theme of playing as a corrupt politician is kind of fun for anyone with even a passing interest in politics. In some ways the game does a good job utilizing the theme as you can have a few laughs as everyone tries to be as corrupt as possible. The problem is that the game shows its age at times. This is not all that surprising since the game was made in the 1970s after all. In a lot of ways you could say that Lie, Cheat & Steal was before its time. Roll and move games from the 1970s are not what I would consider particularly original. Lie, Cheat & Steal tried to do things that weren’t being done back in the 1970s. For example adding a bluffing mechanic to a roll and move game was quite unique. The game had a lot of potential for when it was created. Unfortunately the game never lives up to that potential. By far the biggest problem with Lie, Cheat & Steal is that the game is harsh and unforgiving. I don’t know if I have ever played a game that is so harsh on the players. If you play the game be prepared to go bankrupt multiple times especially early in the game. It is really hard to build up your cash and vote reserves. As soon as you gain some ground you are almost guaranteed to land on a space that takes it all away. Maybe it is just me but it is not very satisfying playing a game where it is hard to make any progress. Everyone in our game might have just been really unlucky, but I have a strong feeling that most players are going to have a hard time making any progress in the game. This leads to the game feeling like it will never end. Good luck getting four or five hundred votes as it will feel like you will never make it to that point. When you finally get close to that threshold you could easily lose everything in just a couple turns. The only way to ever make any real progress in the game is to land on one of the few really good spaces. In particular there is a space where you can raise your salary and another space where you can buy a lot of votes for a bargain. Good luck winning the game without landing on these spaces as it otherwise will take forever to accumulate enough wealth and votes to win the game. For a game that gets pretty repetitive after about 30 minutes, the game really starts to drag as you approach the hour mark. Unless someone gets really lucky, expect the game to take at least 60 minutes and more likely 90-120 minutes. I would genuinely recommend lowering the number of votes you need to win or you might be stuck playing the game for hours. All of this leads to the game relying on a lot of luck. There is a little strategy in figuring out how you want to spread your resources between votes and money. Unfortunately you rarely have any of either so it doesn’t really matter. Otherwise there is basically no strategy to the game. Your success in the game is going to come down to who rolls the best and who draws the best cards. If you aren’t lucky you won’t win the game. You could make some bad decisions that will help you lose the game, but strategy won’t help win you the game. Outside of the game relying on luck, it mostly relies on just messing with the other players. In order to get ahead in the game, you have to mess with the other players. The game really emphasizes you lie most of the time as the benefits usually outweigh the costs of getting caught. As the game gives you plenty of ways to mess with other players, it is easy for players to gang up on whoever is in first. The game can be cruel as you could easily go from almost winning to going bankrupt within a couple turns. The game just doesn’t feel fair at times. At the same time I don’t think the designer thought out every aspect of the game. In particular the game requires players to remember their lies for every card as well as their salary. The game gives you no components to help you remember what players said about cards so the players have to try and remember all of the lies that the other players gave. In addition each player has their own salary to keep track of and yet the game gives you no way to keep track of it. I would highly recommend using a sheet of paper to try and keep track of each player’s salary as it goes up and down. Even if they were very basic, the game could have included some sort of components to help players remember these things. Speaking of components, the component quality is not great. I will give the game a little leniency as the game is over 40 years old and it was made by a smaller publisher. Nonetheless the components aren’t good. The gameboard is pretty thin and bland overall. The other components are quite generic as well. The components mostly due their jobs but they aren’t anything special to look at. Should You Buy Lie, Cheat & Steal? While I didn’t think Lie, Cheat & Steal was going to be a great game, I have to say that I was still a little disappointed by it. For a game made in the 1970s, I saw potential in the game. I am generally not a big fan of roll and move games, but there were some interesting ideas in Lie, Cheat & Steal. The idea of adding a bluffing mechanic to a roll and move game was quite clever. Being able to lie about what is on the cards you draw could have been a fun mechanic. The game even had a little more potential for strategy than your typical roll and move game and the theme is intriguing. The problem is that the game doesn’t work right. The game can be downright cruel as it is hard to make any progress in the game. Get ready to go bankrupt several times as it is hard to acquire any wealth in the game. This leads to the game taking forever where you likely will want to end it early or just quit playing it. Add in a lot of luck and subpar components and Lie, Cheat & Steal has too many problems to overcome. Lie, Cheat & Steal could have been a good game but it has too many problems making it hard to recommend. If you don’t like roll and move games or the theme, I wouldn’t recommend playing it. I honestly would only recommend the game if you really like the premise and are willing to put in the work coming up with some house rules to fix some of its problems. Adds some really interesting mechanics to a roll and move game. An interesting theme for a roll and move game. You go bankrupt far too often where it is hard to make any progress.